Pinewood Jedi Sims will go through all the build steps of making a fast pinewood derby car. He'll demonstrate how to do this on a bandsaw, drill press, etc. so this class should also be helpful to those without a woodworking background. Room in the garage will be limited, so just adults please. Class date is listed above, check your email for directions to location. You can learn everything you need to build a fast car at derbytalk.com. Hint: search for ‘Rail Riding’. Polishing axles is a must, so go get wet-dry sandpaper in grits ranging from 200 to 1200 grit. Optional metal polish after that. Cars with weight toward the back of the car will go faster. Zinc weight (the cheap stuff at the hobby store) isn’t dense enough. You’ll want lead weight or tungsten. Lead is cheap, but toxic, so take care. The hobby store doesn’t carry it. Tungsten is very expensive, but available at the hobby store. Remember that the scout is supposed to build his car as much as possible. Don't panic if you don't have the tools to work on your car. This year we will be holding derby workshop sessions. At the workshop you will have access to bandsaws, sanders, drills, etc. Workshop date is listed above, check your email for directions to location. Remember that this is a scout-parent project! Parents shouldn't be building cars for their scouts. They can do more than paint -- get them involved! The FSK District SuperDerby rules are available here. 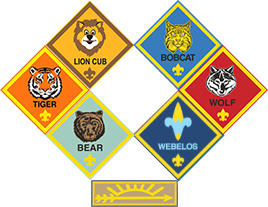 Pack 1070 will use these same rules, with the following exceptions: Each scout will race in 8 heats (2 in each lane), with the lowest of the 8 times dropped to determine the final standings. Trophies will be given to the top 3 in each rank. Throwdown Challenge – There can be only one. Find out who is the fastest parent in town. Same rules as the Open Division, just tougher competition. Enter if you dare. Tears will be shed. Bring your own tissues. Outlaw Division – Cars that ignore the rules. Over 5 ounces, razor wheels, battery powered? You can still race it here. Pre-registration helps us minimize race-day problems. Please use this spreadsheet to register your cars. To register, find the tab with the correct rank and just fill out the Car Name field next to your scout's name. Friends and family can register for the Open, Outlaw, or Throwdown Challenge divisions. During the morning of the race, you will have an opportunity to run your car down the track a few times and fix any lingering problems. Scales will be available to do any final adjustments to your car's weight. All adjustments must be complete by 12pm when registration closes. Racing will begin at 1pm. Registration will be open from 9am until 12pm for all cars. We don't want it to get real busy at the end, so don't wait until the last minute. Food will be available for those who want to dine in. Below are the estimated starting times for each group. Use them as general guidelines only. Racing may start earlier than these times, especially if there are no-shows. At the January pack meeting I’ll take photos for driver’s licenses. These licenses will be handed out at the race, and the photos will also be shown on the big screen during the races. If you don’t get your picture taken at the January Pack Meeting, please email a head & shoulders photo to derby@pack1070.org. Siblings get licenses too, so send photos for them as well. Pinewood Derby cars can have a maximum weight of 5.00 oz. Typically additional weights will need to be found to bring cars up to weight. These weights are not part of the car kit. The official race scale will be available at the Pinewood Derby workshop and the January Pack Meeting for checking your car’s weight. You will need to bring your own weights and the means to attach them. The hobby store sells two types of weight material: zinc and tungsten. Zinc is very cheap, but not very dense. Because it isn’t very dense, it isn’t easy to get a lot of weight in the back of the car (necessary for a fast car). So zinc isn’t good if you want a fast car, otherwise it is fine. Tungsten is extremely dense, but also very expensive. You only really need to use Tungsten if you want an extremely thin car -- like about ¼” thick at the back. Otherwise lead is much cheaper. Lead is much denser than zinc, but not as much as tungsten. The hobby store won’t sell it because it is toxic. But you can find it in other places (fishing lures, etc.). Just wear safety glasses when cutting, wash your hands when you are done with it, and don’t try to melt it down. I have some lead weight available to purchase. 6” long wire 3/8” diameter. Drill a 3/8” diameter hole (25/64” is better) and cut the lead to fit. It can be cut pretty easily with most tools. They will be available for $5 each at the workshop and pack meeting. The top 3 finishers in each of the racing classes mentioned in the SuperDerby rules will be eligible to go to SuperDerby with their registration paid for by Pack 1070. More SuperDerby information here. In addition, anyone else can participate in the SuperDerby but will have to pay for registration themselves.